A baker friend taught me to grate frozen butter for biscuits and pie crusts, which spreads the fat throughout the dough so you never have to cut it in. That’s the way many southern cooks make ham biscuits using self-rising flour. After baking, the rounds are filled with ham. 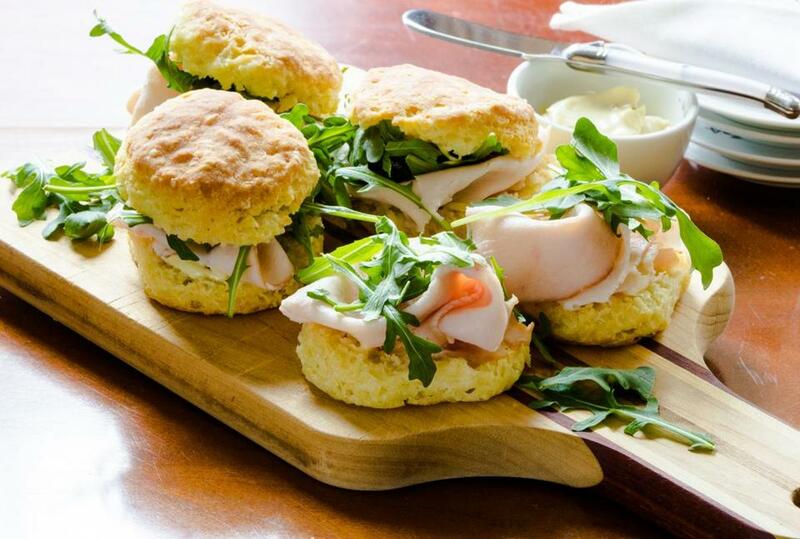 These, made with all-purpose flour, leavening, and buttermilk, are sandwiched with smoked turkey and arugula, and spread with mustard-mayo, so you get smoky, sweet, spicy, and buttery tastes. Biscuit recipes, like pie crust formulas, have pretty standard proportions; the secret to a light, flaky crumb is handling the dough as little as possible. A 2-inch cutter will make 11 biscuits with rerolled scraps. You can make them smaller, but they’ll look like they belong on a tea party tray instead of a Super Bowl spread. 1. Set the oven at 450 degrees. Line a 9-by-13-inch baking pan with parchment paper. Butter the paper. Have on hand a 2-inch plain round cookie cutter. 2. In a bowl with a fork, stir the flour, baking powder, baking soda, and salt to blend them. 3. Remove the butter from the freezer. Unwrap it and use the paper to hold it at one end. Set a grater with large holes over a piece of parchment paper; grate the butter onto the paper. Stir it into the flour mixture. until there are no dry patches at the bottom of the bowl. 5. Turn the dough out onto a lightly floured counter. Sprinkle with flour and use a bench scraper or blunt knife to cut through the clumps half a dozen times until it comes together to form a dough. 6. Sprinkle the counter and a rolling pin with flour. Roll the dough to a ½-inch thickness. Dipping the cutter often in flour, stamp out rounds as close as possible. Reshape and reroll the scraps. You should have 11 biscuits. 7. Set the rounds 3 across in the baking pan — it will be a tight fit — making 4 rows total. 8. Bake for 20 to 25 minutes, or until the biscuits are golden brown. Cool on a wire rack. 1. In a bowl, whisk the mayonnaise and mustard.